How sweet is it that our little co-op is now selling produce from Full Circle Farm in Carnation and Nash’s on the peninsula? I can hardly restrain myself. Among recent pickings was a bundle of baby bok choy, with dense stems that looked downright puny compared to what you find in Chinatown, but I’m of the belief that most good organic vegetables come that way. I set my sights on a favorite bok choy preparation, flat rice noodles with sliced beef and oyster sauce and chopped thai basil stirred in at the finish. It happened that we were missing some of the key ingredients, though, and then Charlie reminded me he was headed out to play hockey, prompting a swift relaxation of standards. Chop bok choy and slice mushrooms. Combine final 7 ingredients with about ¼ cup water and stir well to dissolve the cornstarch. Heat wok or heavy skillet over high heat. Add ground pork and cook, stirring, until meat starts to brown and render some fat, about 3 minutes. Add garlic and ginger and stir again, then add bok choy and mushrooms. The bok choy will turn a bright green color, in 2-3 minutes. Pour in the sherry-based sauce at this point. The sauce should thicken quickly; serve over rice as just soon as vegetable is cooked through but still crisp. Feeds 2. 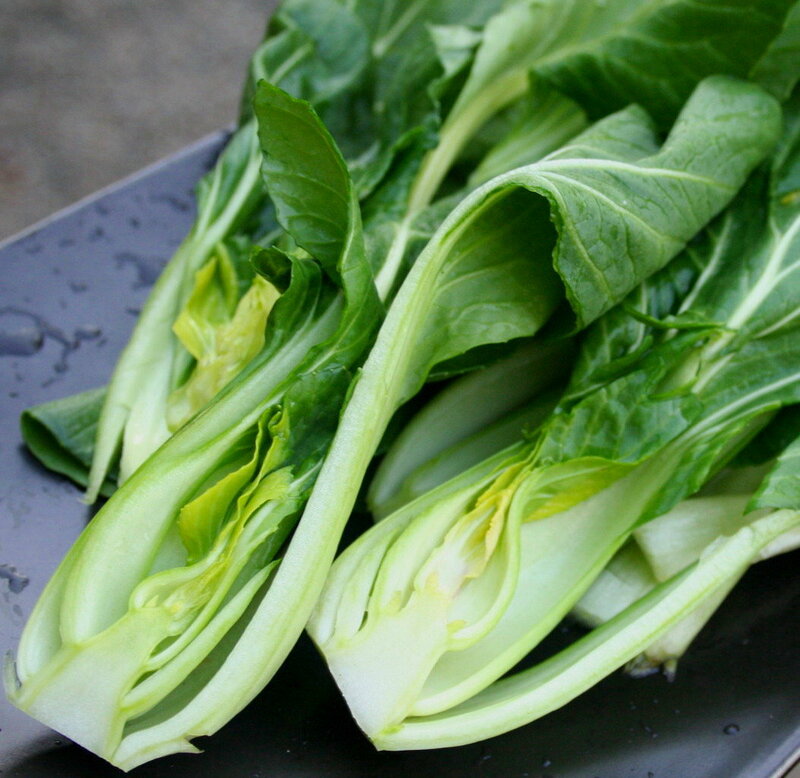 Check out some more growing and cooking ideas for bok choy. Hey, Audrey! I’m coming through Seattle (arriving via Amtrak Sun 6/22 late evening, getting back on the train Mon 6/23 afternoon) with family and would love to find a nearby (we won’t have a car) farmers’ market and a restaurant that serves local foods — I’m thinking Pike Place Market and Matt’s in the Market? Any other advice? Hi Val, how fun that you are visiting! Sounds like you may be too late for the Sunday neighborhood markets, which are easy to get to from downtown Seattle by bus — West Seattle FM closes at 2pm (buses 22, 54), Ballard closes at 3pm (buses 17, 18), and Capitol Hill closes at 3pm (43, or walk). Go figure, Monday there are no neighborhood farmers markets. Pike Market is open every day — they have many local things but some of the produce comes from further afield and the vendors don’t always tell you. Still, it’s worth visiting. As for restaurants, Tilth and Sitka & Spruce are the two that promote themselves as exclusively using local ingredients. Matt’s in the Market is wonderful and he’s not so in your face about it but uses really amazing ingredients, mostly local; same with Union at 1st & Union. Thanks Sally, sometimes I buy vegetables because they’re so nice to look at, then have this how-to-eat-them trouble. I bet Heath (of Wooly Pigs) would bring some ground pork for you to the farmer’s market if you asked. I couldn’t believe how much of it there was when the butcher ground the trimmings on our half-pig. But it’s come in handy.